Regarded as the original aftershave, Alum is a mineral stone that contains exceptional natural properties to soothe the skin after shaving. Just dampen the block and gently stroke over the face. What You Need to Know About "Wet Shaving"
Open the pores with hot water. Apply skin food in an upward motion to soften the beard. Lift the beard from the face by lathering up in a circular motion against the grain of the beard with a good quality badger shaving brush, a modest amount of cream or soap and very hot water. Use the finest badger brush you can afford, and a Mach 3 or Sensor razor. A brush should be as large as possible to hold the maximum amount of water, and yet firm enough to make a good lather. Use cream, not soap, if you require more moisturizer. Shave in the direction the hair grows! If necessary, shave across the grain, but never against the grain. Put cold water on the face to close the pores. Pat the face, and then apply Coral Skin Food or balm to moisturize the skin. 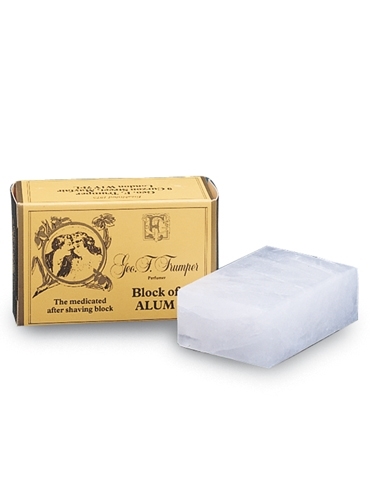 Use a Block of Alum to stop a cut from bleeding. Save alcohol based aftershaves or colognes for after the face has cooled or use them on other parts of the body. Rinse the razor and brush well, shake out the excess moisture, and hang the brush to dry upside.